An ArcGIS software-based plan-to-provision solution enables the development of customized design wizards. Location data is collected on mobile devices and automatically updated to the ArcGIS for Server geodatabase. Multitechnology infrastructure spatial data can be centrally stored and accessed with GIS. Bell Aliant, one of North America’s largest regional telecommunication service providers and the leading fiber-optic service provider in Canada, has set a goal to offer Fiber to the Premises (FTTP) technology to more than 650,000 customers by the end of 2012. Up-to-date network views provide a snapshot of equipment, capacity, available bandwidth, demographics, and customer information. Known as “the future of connectivity,” FTTP technology sends signals from a broadcast distributor or Internet service provider directly to the home using fiber-optic cable. This technology is superior to traditional telephone and cable wires because it uses light to carry Internet transmissions and television signals at rates that are simply not achievable through legacy transmission media. Congestion is alleviated, enabling transmission speeds of more than 200 megabytes per second, so that customers can enjoy some of the fastest download and upload speeds available. One of the greatest obstacles to delivering FTTP technology is that it can be cost prohibitive and take years to install. In some cases, telecommunication service providers have spent more than $1,000 per subscriber to make the service available. When Bell Aliant first began to roll out its FTTP service—FiberOP—in 2009, the company was restricted by time-consuming data collection processes that required information to pass through multiple entry points. By the time surveys were completed and manual measurements were performed, it could take five employees up to two weeks to prepare field data for the verification stage. With a goal to accelerate the rollout and cost-effectively expand its FiberOP digital services over the next three years, Bell Aliant quickly recognized the need to automate the design and data collection processes. After an initial trial period, Bell Aliant selected Network Engineer from Telcordia Technologies, Inc. (Telcordia is now part of Esri Partner Ericsson of Stockholm, Sweden), along with Design Assistant, a GIS-based plan-to-provision solution that enables customized design wizards to be developed in accordance with an organization’s unique engineering rules. Built on the ArcGIS platform, Network Engineer utilizes a sophisticated database so that spatial information pertaining to a multitechnology infrastructure can be centrally stored and accessed. It also provides real-time, accurate network views so that users get a snapshot of equipment, capacity, available bandwidth, demographics, and customer information in a single view. These up-to-date network views are available to not only engineers but also other stakeholders throughout the organization, such as field crews, management, marketing, customer service, and finance. Built with open APIs, the solution can be configured and integrated into almost any environment so that users can get up and running quickly. Since this was the first time that Bell Aliant had worked with a GIS-based solution, the company joined forces with Telcordia and Esri Canada Limited’s professional services team to identify requirements, undergo training on the new technology, and create custom design wizards. Bell Aliant also decided to use an advanced fiber-optic cable system with factory-terminated network access points along the length of the cable, which reduced installation time by 50 percent. Data is collected using ArcGIS for Windows Mobile on Trimble devices, quality checked, and automatically updated to the ArcGIS for Server geodatabase. However, the use of this cable meant that the engineering design had to be extremely accurate. In response, Bell Aliant customized Telcordia’s Design Assistant Wizard module, which automated the design of the FSAs including cable and connection counts. 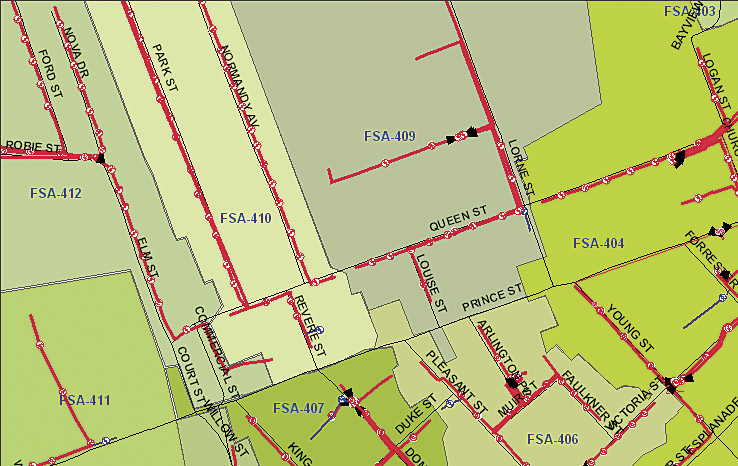 To further contain costs, Bell Aliant collaborated with municipal governments and regional electric utilities to leverage existing GIS data layers, such as land parcels, civil infrastructure, streets, and utility rights-of-way, that were migrated into Network Engineer. Working with Esri Canada, customized web-based forms were developed that make it easy to access and edit this data remotely. Data is collected using ArcGIS for Windows Mobile on Trimble devices and then quality checked and automatically updated to the ArcGIS for Server geodatabase. Network Engineer and Design Assistant are used for everything from planning to designing and building the FTTP network. Since implemented, data quality has improved overall by 25 percent. The company has also been able to transition residential data from more than 500 separate databases into a single, unified common operational picture that provides access to equipment, network components, customer information, and service locations for the FiberOP network. Now, when a customer calls to inquire about service, a single database can be referenced immediately to verify the customer’s service area. Since the data can be accessed remotely, engineers located in different provinces throughout Atlantic Canada can easily share data. The solution proved so successful that FiberOP was made available to 156,000 additional premises in the first six months of 2011 alone, and FSA design times were reduced by 40 percent. In 2011, Bell Aliant conducted an audit of some 305,000 poles located across Nova Scotia, New Brunswick, and Prince Edward Island. Using Trimble devices equipped with ArcGIS for Windows Mobile, Bell Aliant was able to document attachments belonging to various service providers and sync the information back to the database for instant updates. Customized web forms ensured that the data collection process was consistent among the 75 field crew members dispatched across three provinces. They were also able to easily share data with one another regardless of geographic location. 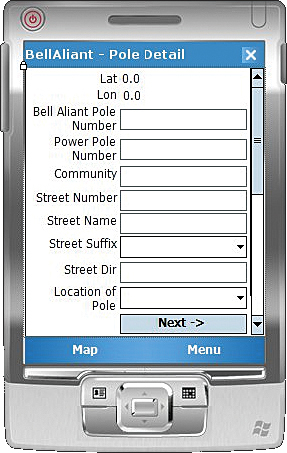 In addition to pole attributes, field crews leveraged built-in GPS functionality to capture the distance between poles and the length of various transmedia networks. Collectors identify the ownership and, using web forms, record this information to ensure that the correct organization is billed. Collected data is also used to track the number of poles that are placed each year and to monitor asset investments. Asset information that used to take days to search can now be accessed in a matter of seconds. For more information, contact Shelley Scott, GIS team lead, Access Support Systems, Bell Aliant.